Taking antidepressant medication increases the risk of death by 33 percent, according to a new study published Thursday. Researchers at McMaster University in Canada found that the meds can prevent major organs from functioning properly by blocking the absorption of serotonin – a vital chemical that is used by the heart, kidneys, lungs and liver from the body’s bloodstream. Scientists pooled data from hundreds of thousands of people to get the results. They also found that those who down antidepressants had a 14 percent higher risk for cardiovascular problems, like stroke and heart attack. The results were published Thursday in the journal Psychotherapy and Psychosomatics. One in eight adults Americans take antidepressants, which are among the most commonly used medications. 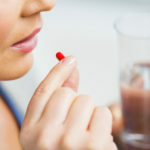 The McMaster study undermines the idea that antidepressants actually save lives by reducing depressive symptoms, according to co-author Marta Maslej.